The new luxury ELEMENTOS apartment. High standard and excellent location - in the heart of Krakow, near Wawel Castle and the ICE Congress Centre of Krakow. Good access to the ARENA hall Krakow. The apartment has a balcony and air conditioning. It consists of 3 bedrooms and 2 bathrooms and can accommodate up to 12 people! Comfort and luxury for less. The apartment is located near the New square, Wolnica Square and Szeroka street, churches: Corpus Christi, Catherine's and Pauline monastery on the Rock. Within a few hundred meters there are a synagogue of Remuh, High, Old, New, Isaac, and others. The district is also famous for its climate and restaurants, cafes and bars, as well as a favourite meeting place for tourists and Cracovians. The apartment has got free internet (wi-fi) access, stereo system in the living room. - Not guarded - around the apartment 1h / 3PLN. Paid hours 10.00-20.00 on weekdays only. 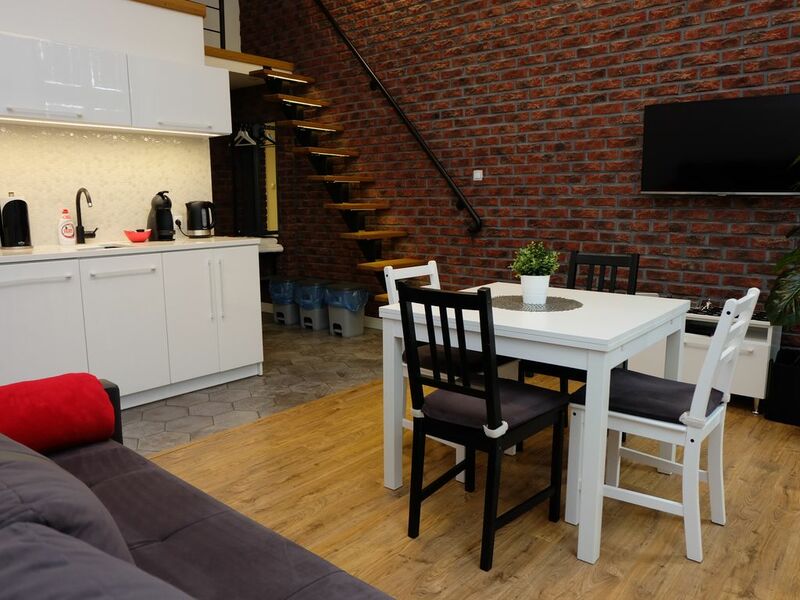 The apartment charges a deposit of 400 PLN. The deposit is returned upon departure. Really cool place in a nice area. Very stylish and comfortable. We loved the layout. The stairs to the loft were a little scary as they did not have a barrier or outer railing and older folks and little kids could take a bad fall. Overall, it was great and I would stay again. Other things to note is that parking is a bit of a distance and there is no lift. I would highly recommend this space for teens and younger adults. This was a real unexpected treasure. Originally born and raised in Krakow, I was so pleasantly suprised with this apartment. Located in the best part of Krakow, colse to the best attractions walking distance. The hosts are superb, kind and always reachable. The the apartment its self ... Wow no wrord to describe it, an extremely under priced, spacious, cozy, classy and exceptionally clean. I would give it more stars if I could. I am coming back soon!! Thank you Slawek, Monika, it has been a pleasure dealing with you! Responsive manager, spotlessly clean, stylish apartment with comfortable beds and good bathrooms. Suited our group of 4 very well and would certainly accommodate a bigger party comfortably. Thank you for your booking and hope to see you again.